Water quality is a concern for Western states because with the arid climate, there isn’t a lot of water and so the little bit of water there is needs to be protected. Water quality – or the lack thereof – is inextricably linked to the health of the landscape. This is most dramatically evident in wildfire-affected areas, where post-fire debris and sediment can affect the watershed for years. A webinar presented by the Western Governors Association as part of their National Forest and Rangeland Management Initiative examined some of the challenges Western states face in promoting forest health and discussed the how federal, state, and local governments are working with private stakeholders to address these challenges. The speakers were Fawn Bergen, Global Program Manager, Water and Carbon Footprint for Intel Corporation; and Bruce Hallin, Director of Water Supply for the Salt River Project. The webinar was moderated by Marcus Selig, Vice President of Field Programs with the National Forest Foundation. Marcus Selig began by saying it’s important to look at the big picture on water sustainability and reliability because what happens in our watersheds – in the forests and the rangelands will affect downstream water quality, water quantity, and water delivery. He pointed out that just the national forest lands managed by the US Forest Service provide water to over 123 million people in our country. Wildfire is the ubiquitous problem faced across Western forests, and the reason we’re facing this is because of the trajectory that the forests are on. In much of the West, they are fire-adapted ecosystems or forests that used to experience fire on a regular interval, but the policy of fire suppression over the last century has allowed more trees to come up than normally would have been reduced in number by frequent fires, Mr. Selig said. There are a lot of other activities important for maintaining watershed health from a management perspective, such as sediment and erosion control or controlling what’s coming off our roads and our trails in our forested systems and our rangelands, Mr. Selig said. As Director of Water Supply at the Salt River Project, Bruce Hallin helps to oversee the utility’s delivery of ground and surface water to its 250,000-acre service territory within the greater Phoenix metro area. Much of the water they serve comes from the Salt and Verde watersheds, which cover over 13,000 square miles of northern Arizona, including northern Arizona’s forests. His presentation focused on what the Salt River Project is doing to improve their watersheds. Mr. Hallin began with some background on the Salt River Project. The Salt River Project was formed by a group of farmers in the late 1800s that settled the valley and began agricultural practices. Prior to Arizona’s statehood, the farmers approached the federal government because they needed a secure water supply which could only be achieved by building water storage as the water supply in the southwest is extremely unreliable without some form of storage. So the landowners partnered with the federal government in 1903, putting their land up as collateral, and constructed the Roosevelt Dam, which essentially started the Salt River Project, he said. One of the byproducts of moving water through a dam is hydroelectricity, and so the project began delivering hydroelectricity as well. Today, the project is a Bureau of Reclamation project which includes seven dams and reservoirs which are owned by the federal government. In 1917, the Salt River Project took over the operation and maintenance of the facilities, which includes not only water supply but hydroelectric power to over 1 million customers. “We’ve been operating and maintaining the facilities for over 100 years and have a very strong and positive working relationship with the federal government, and in particular, the Bureau of Reclamation,” said Mr. Hallin. The Salt River Project encompasses 13,000 square miles and two watersheds, the Verde and the Salt River watersheds. Although they are both about the same size, the majority of the water supply comes from the Salt watershed because that watershed has more square miles at a higher elevation which receives primarily snowfall and it is the snowmelt that feeds the creeks which feed the rivers that feed the reservoirs, he said. Most of that terrain is National Forest Land; over 95% of the Salt River watershed is federal land, as well as a significant portion Indian reservation lands, so Mr. Hallin said they work closely with the federal government on the management of the watersheds. Recognizing the deteriorating condition of their forests, the state of Arizona has pursued the Four Forest Restoration Initiative. 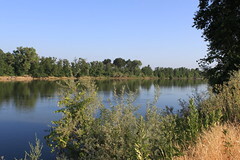 The Salt River Project works with the Bureau of Reclamation and the Four Forest Restoration Initiative to protect the assets and the investments the federal government has made. The Salt River Project consists of two dams on the Verde River, four dams on the Salt River, and one dam which impounds water from East Clear Creek. Mr. Hallin noted that East Clear Creek is a much smaller watershed with only about 64,000 acres of National forest land, all of it at risk of catastrophic wildfire, so they have been working with the Forest Service, the National Forest Foundation, the town of Payson, and the Bureau of Reclamation to go through an environmental assessment and to get treatments done as soon as possible. He presented a map (lower, left) showing the extent of fire within their watershed, noting that wildfire is a major concern. Arizona has also been experiencing drought as is much of the southwest; at this time, the watershed is extremely dry and there’s virtually no snowpack. Damage to water and power infrastructure: Wildfires can damage both water infrastructure and power infrastructure which includes a significant number of large transmission lines that cross national forest lands. “These catastrophic wildfires don’t happen during the shoulder months when you’re not using a lot of power; they are going to happen during the summer when its 110 degrees or 115 degrees here in the valley and we’re depending on that energy moving through those transmission lines to cool homes, etc, so there’s significant concern about damage to infrastructure,” he said. Water quality degradation: Mr. Hallin noted that many of the cities in the Valley now have had to upgrade their treatment plants to account for increased organics and sediment loading, so they don’t want to see the quality of that water degrade any further. The Salt River Project has a 250,000-acre service territory that serves the greater Phoenix metropolitan area; Mr. Hallin said there was a real disconnect between the population centers and the national forest lands, so their first efforts were on education. A component of that education included emphasizing the utility’s involvement in forest management for well over 100 years. The second component was to connect the valley’s water supply to the forested lands. “When there is a large catastrophic wildfire, many of the urban people believe it only impacts those who reside within those forested lands or the recreational values or the fisheries, wildlife, etc., but it has a direct impact on their water supply, so that was part of our education,” he said. The Salt River Project has been partnering with other organizations, such as the Nature Conservancy, which is currently is working on a four year 20,000-acre project with the US Forest Service where they are thinning 5,000 acres per year. The Nature Conservancy is working on improving efficiencies and cost management when it comes to thinning these forests, and how to deal with a lot of low value material; he acknowledged that much of the material that has to be removed is low value material, so they are interested in the results of the Nature Conservancy partnership. They have also been working with the National Forest Foundation through the Northern Arizona Forest Fund, which provides a way for individuals to invest in forest restoration projects, as well as cities and businesses more connected and more vested in the improvements in the watershed. “We’ve raised today probably over $2 million through this program, and now most of our focus is to get the trees cut and to reestablish a large forest products industry,” he said. Fawn Bergen is based in the Portland, Oregon office of Intel and leads two of Intel’s sustainability programs, the Global Water Stewardship and Global Carbon Footprint. Ms. Bergen is currently leading Intel’s newest water commitment, which is to restore 100% of global water use by 2025. Ms. Bergen began with some background into Intel’s Water Stewardship Program. Intel has historically been largely a PC company, but they have undergone a dramatic shift, and like most of the technology companies now, they are in the business of data. She noted that Intel has about 600 facilities globally across 63 countries, but really only a handful of those are large manufacturing sites. Intel does a little over half of their manufacturing in the US and the rest is international, and about 98% of all the data in the cloud runs on their silicon. “We really do touch a lot of the world, and we really feel we are playing an important role even just looking from an environmental standpoint at the advances that our technology brings,” she said. Ms. Bergen presented a graphic of Intel’s water footprint which depicts the general flow of how Intel uses, consumes, and discharges water, noting that these are the numbers from 2016. Worldwide, Intel brings in a little over 10 billion gallons of water at all of their sites. In some locations, they are able to buy reclaimed water to offset their freshwater use. “Right now, about 80% of the water we bring in is treated and returned and used back in the community; in Arizona, for example, it’s used to recharge the aquifer,” she said. Intel had a water goal in place for years to reduce water on an intensity basis, meaning the water used per production unit. Now, their focus is on the gap in the water balance which is two million gallons of water or roughly 20% of the water Intel brings in. The water is lost to things like evaporation from cooling towers, water used in scrubbers, and plants and landscaping. “What we see as the gap in our balance, meaning the water that we bring in, anything that we don’t bring back to our communities is the piece that we needed to work on,” said Ms. Bergen. Conserve the amount of water used in operations: Be as efficient as possible. The first global corporation to make a commitment to replenish the water they used was Coca Cola; Intel has made a similar commitment to restore all the water they use globally by the year 2025. Ms. Bergen then gave some examples of projects they have been working on to meet their global target of the water consumption, which in 2016 was about 2 billion gallons. The Mountain Island Ranch project is in Utah near the Colorado border; it is a series of crop conversion and irrigation changes to make it more efficient that when completed, it’s estimated to restore about 141 million gallons per year. The Lower San Pedro Project is a crop conversion project with Arizona Land & Water Trust that when completed, it is estimated to restore about 62 million gallons back to the groundwater which will positively impact the lower San Pedro River. The Barley Verde Project is a partnership with the Nature Conservancy of Arizona; it’s a crop conversion with a twist: Not only is it converting to a lower water use crop which is spring barley, but it’s also switching from crops that need a high amount of water in the summer, and so it not only returns about 60 million gallons per year, but it leaves water in during the critical summer months. Another benefit is that the barley will be used to support a local brewing company. Vanasche Farm IOT Pilot is a pilot project in Oregon, working with a local farm and their irrigation of their baby hazelnut orchard. Using Intel technology, sensors measure the real time moisture of the soil as well as local weather conditions; the farmer is able to pull the information up on his computer and see exactly what the moisture is. The concept is that they will use water more efficiently as well as provides an economic benefit to those farmers because they can know the precise amount of moisture in the soil or the weather conditions. Long Valley Meadow Project is located in the Coconino National Forest up in Verde River Valley; over time, the flow has eroded the natural storage mechanism of the meadow, which has had downstream impacts. When the project is completed, it’s estimated to restore about 20 million gallons back to the meadow. Bird returns is a project in partnership with the Nature Conservancy of California. As drought and development have intensified over years, a lot of the natural habitat for birds has disappeared, so this project provides an economic benefit to farmers to create seasonal wetlands on their property, so they flood their fields, giving the birds habitat for that season; it may shift to another location the following season. Ms. Bergen said this one is estimated to restore benefits of about 47 million gallons per year. She said that they really want to work with partners that have a track record for implementing successful projects, such as the Nature Conservancy, Trout Unlimited, the National Forest Foundation, and Arizona Land & Water Trust. The first question was for Bruce Hallin. Bruce, you mentioned the Salt River Project at the beginning was really focused on the education component and helping inform the Phoenix metro area about the importance of watershed health and the activities that need to happen. Do you have a sense for the effectiveness of that education effort? Is the Phoenix area community supportive of the thinning activities, the burning activities, and the other watershed restoration activities? The next question was for Bruce Hallin. You mentioned the extension of stewardship agreements as being one activity that could help spur industry. Can you talk about the other items that could be addressed that would help engage industry in treating the many acres of forestland in Arizona that need to be treated, and if there’s any of those that are being used through the partnership with TNC on the stewardship agreements that are being affected? Click here to visit the Western Governor’s Association online. For more on forest management, click here.